LAFD paramedics tend to a shooting victim on Sunset Boulevard in Silver Lake on Thursday, June 5, 2014. 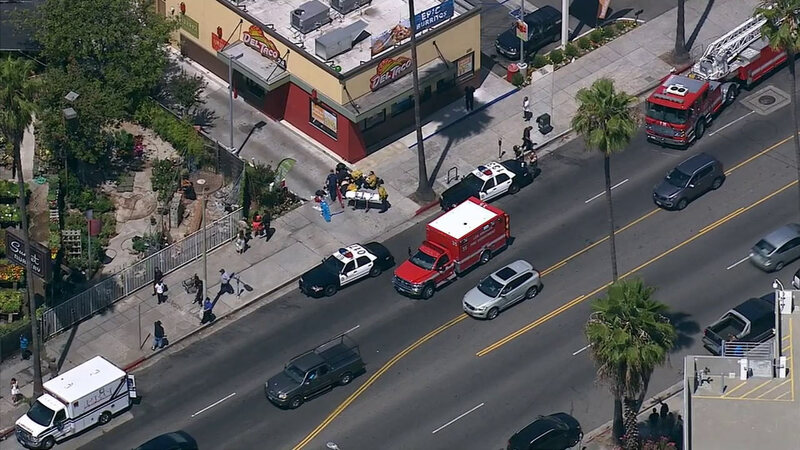 LOS ANGELES -- A man was shot and killed in Los Angeles' Silver Lake area on Thursday in an apparent gang-related shooting. The gunman has not been located. Authorities responded to the 4300 block of Sunset Boulevard, near Fountain Avenue, just before 11 a.m. A 30-year-old man was found with a gunshot wound to his chest. The victim was rushed to a local hospital, where he later died. His name has not been released pending notification of next of kin. Police say a small black vehicle was seen leaving the area. No further suspect information was immediately available. Thomas Starr King Middle School was placed on lockdown as a precaution for about an hour as officers searched for a suspect.